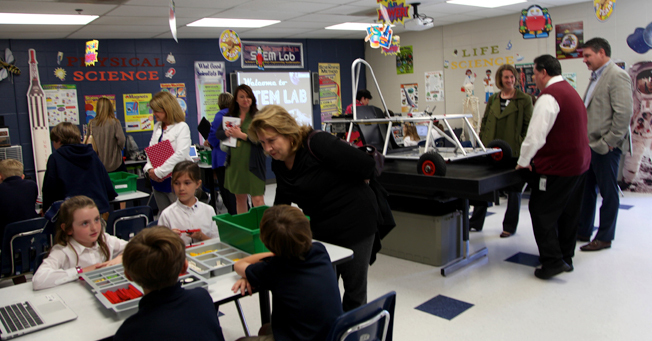 Representatives from three independent and parochial schools in Louisiana, Alabama, and Mississippi were on campus yesterday to tour JA’s STEM program. Educators learned how JA uses innovative Pitsco products in labs and classrooms. JA Headmaster Pat Taylor and Middle School Dean Matt Morgan presented to the group in the PAC, then tours of the Lower School and Middle School labs were given. JA faculty shared how they have structured the curriculum and how JA has implemented the program to make STEM labs exciting and engaging for JA students. Two representatives from Pitsco Education accompanied the visiting educators during the daylong program.